A few days ago I wrote about Wii Fit but I wanted to follow up to the previous post as I’ve now had the game for several days. It was questioned why I’d even called Wii Fit a game. I call it a game because it’s fun! I’ve managed to clock up a decent 15 to 20 minutes worth of exercise every day since getting Wii Fit. The only barrier to getting any more done is the fact that everybody else in the household wants the Wii for Wii Fit! Somehow Nintendo managed to do a really good job at encouraging you to keep working at your fitness. After every activity, a “piggy bank” tells you how long you’ve been exercising for on the current day. Once you accumulate a certain amount of time, new activities and levels are opened up. Gaining good scores on certain activities also releases more difficult or challenging levels of the activity. For example, with jogging there is short distance, long distance and a lap around the island! In conclusion, I feel Wii Fit is a fantastic purchase and really something which could help you towards getting your 30 minutes of daily exercise! Whether it really will encourage people to keep fit in the long run or whether it’s just the novelty factor remains to be seen. But it’s flying off the shelves. Woolworths reported that they were selling 90 copies per minute. From my own experience, my local Woolworths sold out on the day Wii Fit was released. They received extra stock last Friday lunchtime and by the time I bought mine (at about 4PM), they only had two left. 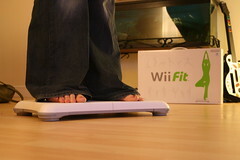 A friend of mine even queued up outside a new branch of GAME at 7 in the morning to get Wii Fit! TBF at least they actually seem to be slightly bothered about peoples fitness?